Now, some people are doubtless going to argue with me on this one. I hear you. Milon’s Secret Castle . . . a windfall? I never beat this game. I never even came close. It was way too hard. I didn’t know anyone that even had the game, and those of my friends brave enough to try playing the copy that somehow ended up in my Nintendo game library were bored or disgusted in about five minutes. It took me longer than five minutes to throw my hands up in frustration . . . when it comes to trying to get through a difficult or frustrating game, I’ve always tended to have a lot of patience, at least compared to the people I know. Even as a kid, as my sister and I stared in perplexity at the complete apparent nonsense happening on the screen, I stuck to the game long enough to somehow beat the first boss and get to the second floor of the castle. And that’s where both my patience and my sister’s cheerleading and meticulous study of Nintendo Power magazine finally broke down. For the uninitiated, Milon’s Secret Castle came out in the end of 1986. I didn’t get it until a couple of years later, probably 1988 or 1989. The instruction manual was . . . sparse. As usual for these early Nintendo games, if you wanted to have any idea what the heck was going on– and then be thoroughly confused later when the game either changed its story or didn’t mention it at all– you’d better have read the manual. Succinctly, Milon is unable to communicate with the people of the Hudson kingdom (the game was put out by Hudson Soft) because they all communicate musically. He is, apparently, the only one in the kingdom who can’t do this. So Milon decides to go on a journey through the land to find other people like himself, and solve the mystery of his isolation . . .
Wow, that would have made an interesting game, wouldn’t it? A quest of self-discovery, perhaps some kind of conspiracy, maybe finding a discontented group of musical mutes he could be conflicted about: join their rebellion or try to talk them down? Well, this is 1986, folks, too complex a concept by far for the NES at this point. Instead Milon decides, before doing this, to stop off at Hudson’s Secret Castle to speak with Queen Eliza. Yes, that is what the instruction manual calls the castle. I watched a longplay of the game to figure out how it ended, as I never even came close to beating it myself, and in the ending Queen Eliza refers to it as “Garland Castle,” so who knows. When he gets there, all hell has broken loose. Some Evil Warlord has rolled in– apparently his name is Maharito and he’s from the north, but the instruction manual we got in the US leaves this out– stolen everybody’s instruments, and holed up in the castle with the captured Queen Eliza. Oh, and the place– which was already a confusing maze of secrets– is now crawling with his demon-monsters. So Milon, the guy that was up to this point planning to go on a nice roadtrip of self-discovery, volunteers to go in there, get the instruments back, defeat the Evil Warlord and his demon hordes, and save the Queen. Uh, wow, dude. Aren’t you just some guy? I know you really want to connect with people and get them to like you, but what part of “demon-infested maze of insanity” did you miss? That Secret Castle is going to chew you up and spit you out. Apparently the court Magician agrees with me, because he makes sure the would-be hero goes in there with a load of good advice and a magic weapon. The weapon is . . . a bubble. Milon can shoot bubbles. Now before you get all sniffy about the lameness of such a weapon, may I refer you to Bubble Bobble? Taito had released it just a few months before in arcades (it would be ported to home systems later), and everybody who’s an old school gamer knows about Bubble Bobble . . . and probably loves it! Two little dinosaurs platforming along, firing bubbles everywhere! Filling the screen up with them, trapping enemies and then popping the bubbles to defeat them! Simple, elegant, addictive. Yeah, the bubbles in Milon’s Secret Castle aren’t anywhere near as cool as the ones in Bubble Bobble. They fire diagonally, forward and up or forward and down, unlike the ones in Bubble Bobble that go straight out. The enemies in this game fly and bounce all over the place, so the ability to fire straight would actually be really nice. Also, if you power the bubbles up by catching the floating Umbrellas that enemies occasionally drop, you can fire them in rapid bursts of three. That’s it. They don’t stick around, there’s no strategy, the bubbles are just a projectile. They could be pretty much anything else, skinned any other way, and still do the job. Okay, a little disappointing. But hey, a castle full of secrets! Think of all the discovery! The hidden goodies! The rewards for thorough exploration! Imagine being an eight- or nine-year-old kid, introduced to gaming via platformers like Mario. Exploration rewarded you with vines leading up into the clouds or a way to travel over or under the level to reach a hidden room with coins– which could get you extra lives if you collected enough– or a warp zone to let you skip ahead some levels. Exploration was helpful, but you could plug away at the game and reach the end without doing too much of it if you wanted to. Just keep going to the right, and assuming you live through it, you’ll get to the end eventually. Well, I won’t sugar coat it: Milon’s Secret Castle is not only hard, but it’s not even a little linear. That exploration is not just about getting some nifty extras. It is absolutely required to advance. And this game defines exploration as firing those bubbles at everything. Nothing is in plain sight. You have to fire bubbles at pretty much every brick you see to find keys, doors, shops, anything. There’s no visual difference between breakable and unbreakable blocks, either. That Secret Castle business isn’t just a cute name. It’s safe to say that everything in that place is a secret you have to uncover. You’re not really given any clues, either (I’ll get to the ones you do get in a minute). If you didn’t read the instruction manual, not only do you have no idea what the plot is, you don’t know anything about the mechanics, and this game isn’t going to hold your hand. After the title screen it dumps you right in front of the castle. That Magician the manual told us about? All the stuff he said and did must have happened off camera, because he’s not in the game and it doesn’t mention him. There’s no Old Man in a cave on the first screen, like in Zelda, to offer you even cryptic hints. Just boom, there’s a castle! So you walk into the first door . . . and you can’t leave. It turns out to get back out of any of these rooms, you have to find a Key. How do you do that? Well, StrategyWiki.org outlines Key-finding in detail: Keys appear after you collect $4 (money is mostly hidden inside blocks, shoot everything) and either reveal 15 blocks or kill 5 enemies. A Key can appear in more than one location, but only one will ever appear. Well, the internet gave me the answer in about five seconds, but we didn’t have that in 1986. It seemed totally random when that Key showed up. After you fooled around enough in a room, it appeared. Great, now . . . wait, where’s the door? There’s no door. Turns out you have to shoot everything, even empty air, to find doors. You have to be very specific about where that bubble lands, too. Firing at the floor won’t do the job, you have to fire about one block up from the floor where a door is to reveal it. Huh? It just dumped me right back outside where I entered? Remember, you’re eight years old. You’re used to finishing a level and moving on to the next one. OK, well . . . go back in, I guess? There must be something else there. There certainly is. There’s a Honeycomb, which not only refills your life, but extends your max health by one bar. These things are worth their weight in gold, apparently every room has one, so find them. There’s $16 hidden in blocks in the room– money is super important in this game, and most of the time it doesn’t respawn when you leave and re-enter a room, so make sure you grab it. You really need all the items you can buy in shops. Speaking of shops, there’s a hidden one in that first room too. At the bottom of the room, on the right hand side, there are three blocks on the floor. Two of them are hidden money. You’re supposed to push the unbreakable block until it moves, and then shoot the space where it was to find a door! There’s no pushing animation, Milon just runs against the side, and it takes about three seconds for anything to happen, so this is very easy to miss. Through the door is a shop with the first item (which you can buy $6 cheaper a couple of rooms later), and a couple of hints. Oh, great! Hints! Finally, some guidance! What are the hints? The first one is: “Secret entrance in the front wall.” OK, not so bad, I guess. Maybe there’s some item I get later to find it? Can I shoot bubbles outside? Oh wow, is that on the first floor, or could that be higher up? This is a big castle. Is this just more encouragement to shoot everything? I’ll file that away. What about the other one? “Bump head to find box.” Oh, it’s not just shooting everything now? I have to hit my head on every brick I can too? Yikes, this is going to take forever. But at least that taught me something. By the way, look for those Music Boxes, bump your head! They take you to a bonus game to earn money. You’re supposed to be catching musical notes. Notes are worth one point, sharps are worth two, flats take a point away. Apparently this is also the part of the game where you get instruments back for the people of the Hudson kingdom, though the game doesn’t really spell that out for you. The first time you find the bonus game, one person is playing the drums. Every consecutive time you find a Music Box to play the bonus game, another person plays along with a new instrument. I never got far enough to hear the whole song, and you don’t seem to be getting the instruments back as much as being around when people find them and play them for you, but it’s a nice touch, that the song gets more complete the more you play the bonus game. Back to that so-called guidance; other hints are less helpful. “Crystal has mysterious power.” What crystal? The instruction manual says that the seven demon-monsters– bosses, probably?– have crystal balls that are the key to advancing to the next level. Do they do something else? How does that help? I already know I have to get them to advance. If I read the manual. Otherwise this means absolutely nothing to me. Also, “Find a saw.” Why? If it’s in a shop I assume I have to buy it. If it’s not and I uncover it, I’m not just going to leave it there. This game has already taught me to get everything indiscriminately, so telling me to do something I was probably already going to do isn’t helpful. Maybe it could have told me where to use it? What to use it on? Anything, other than “get it”? No? As you can see, hints range from the too-cryptic to the downright unhelpful. By the way, all that stuff in the instruction manual about Milon being unable to communicate with his countrymen because he couldn’t speak music-language? No problem, apparently, he and the shopkeeper understand each other just fine. When you finally rescue Queen Eliza, you can understand her too. Ah, localization. I’m guessing most of that story we got in the manual wasn’t originally part of the game. Anyway, that’s the easiest room, and there are many more, some even more confusing. On the first floor, for example, you can find yourself in an empty room with a locked gate. Turns out that’s a boss room. He doesn’t show up until you buy the Shoes and the Medicine from shops that you have to find by shooting everything some more. As a kid, this game was absolutely mind boggling. Everything was so open, things needed to happen in a certain order but you were given no guidance at all as to what that order might be. You were guessing, spamming the fire-bubble button at everything to collect stuff. It didn’t matter what the stuff was, for the most part (some of it would later, but I never got that far), you just had to have it. On top of all this “exploration”– I use quotes because it feels more to me like shooting everything and getting lucky– you have enemies and platforming to deal with. There are lots of enemies, and they respawn pretty quickly. The icing on the enemy-fighting cake is that there are no invincibility frames, meaning that unlike most games of the time, when Milon gets hit, he doesn’t get an invincibility period, so your health can drain very quickly. There’s no grace period when you go in and out of a door or a bonus level either, and you can (and will) get cheap-shotted by an enemy or a projectile. Speaking of exiting doors and getting cheap-shotted, don’t stand outside the castle for too long! The box art shows lightning forking over a dark and foreboding castle, and apparently that wasn’t just for show. Little lightning projectiles will start bouncing around the screen, so you’re not safe outside between levels. If you need a break, hit the pause button! Also, for a game that’s supposed to be about music, one would think there’d be more of it. There are a couple of different tracks– for bosses, for the spooky level in the well, etc.– but most rooms play this almost whimsical, happy-go-lucky music. It always felt a little weird, fighting for your life against the demon-hordes, groping your way through this impossible maze, to the lilting sounds of carnival music. Finally, you get one life. There’s no password function. If you die, you start over . . .
. . . unless you read the instruction manual! If the player holds left on the control pad while pressing the Start button at the title screen, he or she can start where they left off, assuming they have beaten the first boss and gotten the first crystal ball. This left-start-continue thing is apparently common for Hudson games of the era. I have no idea if this works if you turn the game off, though; I’d be surprised if it did. So if you wanted to beat the game in one sitting or if your mom let you leave your Nintendo on day and night, you could continue. 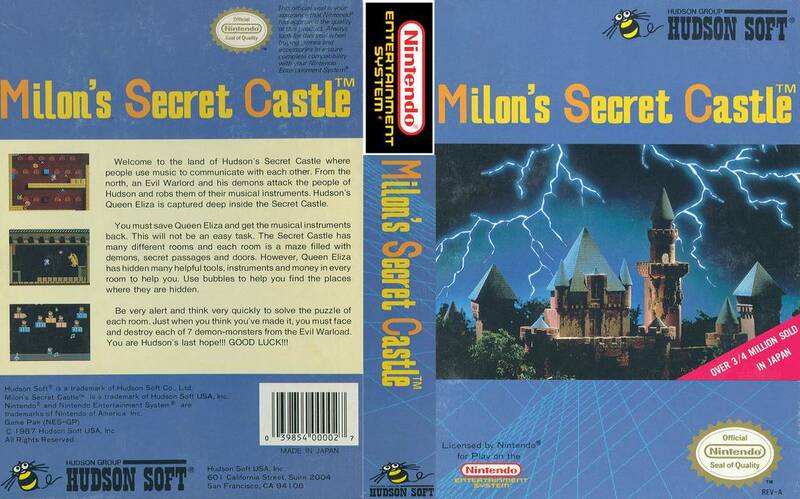 In 1993, Milon’s Secret Castle was released on the Game Boy. It was very similar to the NES edition; not everything was in exactly the same place because the screen was smaller, but apparently it was close. The game had a password feature, items in stores cost less, and apparently the boss fights were way easier. The entire body of the boss was vulnerable, not just the head, they only fired one projectile at a time, and the projectiles were smaller and more focused on your current position, making them are easier to dodge. That sounds pretty great, because the bosses in the NES version are spastic little buggers with projectiles flying every which way. Combine all that with no invincibility frames after a hit and it adds up to bosses killing you fast. Certain items later in the game make boss battles easier (the Super Shoes to jump really high, the Blimp to float down from a jump, and Excalibur to make Milon’s bubbles hit harder), but they’re still quite difficult. Now, I’ve been trying to represent this game from an eight-year-old’s perspective. Obviously, that’s not entirely fair. The items you buy from stores do all have a use, even if it’s not immediately obvious what they are. They all either power Milon up some way or allow you to better navigate the puzzle/maze rooms. So saying that it doesn’t matter what the stuff you have to collect is isn’t strictly true, that’s just what it felt like at the time. Also, the game is very punishing in terms of projectile dodging and enemy killing, but some people really appreciate that kind of difficulty. In a YouTube comment on the World of Longplays’ full-play of Milon’s Secret Castle, ReploidHunterSigma says that the game “feels like what Dark Souls might’ve been as a 80’s platformer,” and they make a good point. As they elaborate, “nobody tells you about anything, the game’s difficulty is high, Milon must be undead because he’s consuming hearts (souls?) to regain health, and it’s based around exploration and trying stuff until something works”. While I think the Milon being undead theory is a bit of a reach, the comparison is a good one. In terms of story, the game was disappointing. The only bit you get is in the manual, the game seems to actively contradict some points and doesn’t expand on the interesting ones– namely, the musical culture of this kingdom. My sister and I stuck with the game as long as we did because we were fascinated by that concept. A kingdom where people speak through music? A lone boy that couldn’t, for some reason? And that cute musical mini-game! We were just learning to read music at the time, so catching the sharps and dodging the flats was really satisfying. If we’d gotten far enough to hear more instruments added to the song in that game, it would have enchanted us. As I said, I watched a longplay to see how it ended, and I have to say I’m glad my sister and I didn’t beat the game as kids, because the ending is disappointing, especially after all that work. At the end, Queen Eliza (wearing the crown and holding the cane that you retrieve for her during the game, which is a nice touch) thanks you for saving “Castle Garland.” That’s it. There’s no text or story in the game save when merchants give you hints and Eliza talks to you at the end. Unless you read the instruction manual, you have no idea what’s going on here, who that jerk with the three clones at the end of the castle is (the Evil Warlord has clones, that’s a whole other kettle of fish), nothing. That interesting bit of story in the manual, the part about the people of Hudson communicating with music, which Milon can’t do? Never brought up in the game. If you didn’t read the manual, you wouldn’t even know the name of the lady you’re rescuing, or that she’s your queen. This game came out in 1986, so I understand plot wasn’t a major consideration at the time, and that there wasn’t a lot of room for an intricate one. The other articles in my Windfalls series, however, talk about games almost as old that managed to do better. Despite all the downsides here, I’m still glad I played Milon’s Secret Castle. It’s not a game I’m itching to get out and play again, but I thoroughly enjoyed watching the longplay . . . I’m sure my jaw was hanging open in awe for most of it. That player has moves. As an eight-year-old, I just didn’t know what to make of this game. Up to that point, the video games I’d played had been pretty simple, left-to-right platformers or shooters, things like Mario, Duck Hunt, Mega Man, and Contra. Milon’s Secret Castle had a lot of promise for a musical kid, plot-wise, but the plot never really went anywhere. The thrill of uncovering secrets and figuring things out was pretty cool. The fighting was hard, especially the bosses, but that was something I could have practiced if I hadn’t gotten so lost and frankly, bored. I typically need plot– at least enough for my imagination to fill in the blanks– to stay interested in a sparse game, especially if it’s non-linear, and this game just didn’t have it. This game was a windfall because it expanded my horizons of what a video game could be. I didn’t come close to finishing it, but the memory of this game has stuck with me for all these years, and I think there’s a good reason for that. I think I would have appreciated Milon’s Secret Castle a lot more if I’d been a couple of years older when I played it, and if the game had had more plot. The art was cute and the concept was interesting, and I like figuring things out. Adventures of Lolo was an excellent action-puzzle game. I think Milon’s Secret Castle, which is also considered an action-puzzle game, just needed a little more polish. And maybe a little less saturation-bombing with bubbles to get anywhere. But if you like Dark Souls, this old classic is worth dusting off for sure, and there are some awe-inspiring Let’s Plays on YouTube if you just want to see what the game looked like. The longplay I watched was just shy of an hour long, and let me tell you, it’s old-school game mastery at its finest.